This important work brings together a range of perspectives in contemporary urban analysis. 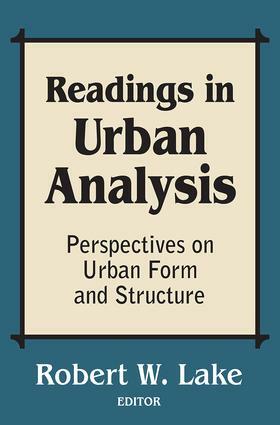 The field of urban analysis is characterized by the multiplicity of approaches, philosophies, and methodologies employed in the examination of urban structure and urban problems. This fragmentation of perspectives is not simply a reflection of the multifaceted and complex nature of the city as subject matter. Nor is it a function of the variety of disciplines such as geography, planning, economics, history, and sociology. Cross-cutting all of these issues and allegiances has been the emergence in recent years of a debate on fundamental issues of philosophy, ideology, and basic assumptions underlying the analysis of urban form and structure. The notion of urban analysis Robert W. Lake discusses focuses on the spatial structure of the city, its causes, and its consequences. At issue is the city as a spatial fact: a built environment with explicit characteristics and spatial dimensions, a spatial distribution of population and land uses, a nexus of locational decisions, an interconnected system of locational advantages and disadvantages, amenities and dis-amenities. Beginning with landmark articles in neo-classical and ecological theory, the reader covers the latest departures and developments. Separate sections cover political approaches to locational conflict, institutional influences on urban form, and recent Marxist approaches to urban analysis. Among the topics included are community strategies in locational conflict, the political economy of place, the role of government and the courts, institutional influences in the housing market, and the relationship between urban form and capitalist development. This is a valuable introductory text for courses in urban planning, urban geography, and urban sociology.